ENJOY AN EVENING OF MUSIC, FOOD, AND FUN. Come enjoy some family fun at NWI’s premier, Laser Tag Arcade! Your weekend registration includes food, beverages, and 2 ½ hours of games and indoor rides. 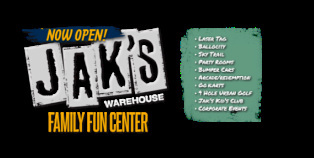 Visit www.jakswarehouse.com for a full list of attractions!